If you have read any of my earlier post you know I had some problems with my right ankle while on my solo canoe trip in the Woodland Caribou Provincial Park. Today I went and saw, Dr. Paul Langer, http://www.mnortho.com/index.cfm?fuseaction=ap.home&apid=283 , to see what could be causing my problem and / or how to correct the problem. About 14 years ago I jumped out of a moving van (work related) and partial tore a tendon around my ankle. This was covered by workman’s comp and I needed some orthotics which I got. 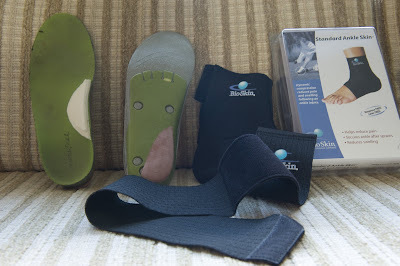 They were good for a couple years but instead of going back I began buying Smart feet insoles for every shoe I had and for every shoe I bought since then. These inserts are very good and they seemed to be doing the job for about 10 percent of the cost of the custom orthotics. Last year I sprained my same right ankle while in Wabakimi. I haven’t had any more problems up until my last canoe trip. Today I went to see Dr. Langer and brought my NRS boots and other foot wear. The Doctor took some x-rays, did a strength exam on my foot and watched me walk. It appears that I have been putting stress on the peroneal tendon so he did some modification to my Smart feet inserts and I should wear an ankle support for awhile. I also got some thick moleskin to put around the inside of my ankle to keep the pressure off the inside ankle if I need it when wearing the NRS boots. Well, hopefully that will take care of my problem. I might need to buy another pair of NRS boots, but one size larger. I did make another appointment in two weeks in case the doctor has to tweak the modifications to the inserts. If the modifications aren’t causing any problems then he told me to cancel the appointment. Then I will need to pick up some supplies to modify all my inserts. It’s only about seven weeks before I head to Armstrong, Ontario to begin a three week canoe trip with Dave Phillips from Virginia on crown land, Wabakimi, Misehkow River and the Albany River. I’ll post more about this trip when it gets closer.